Spring Summer 2014 fashion month is winding down. It is bittersweet for us, observers, relishing the images which flood our instagram feeds! However, we can now translate the runway creations into personal expressions. Take the quilted drop waist dress which debuted in Victoria by Victoria Beckham's SS 2014 presentation, and was subsequently worn by Posh herself whilst out and about! Now, recently, I have become fascinated with quilted garments! It started with the search for a perfect quilted jacket for fall and has now continued into a quiet search for a nice quilted dress and a skirt, which, I will recognize when I see it. High up on my list is this quilted drop-waist ASOS dress! I see myself wearing the fuchsia one with opaque tights and my favorite black Louboutin rolandos for the chilly nights which our Fall season brings or can absolutely wear the black version with sheer black tights, same Louboutin rolandos and glamourize with some heavy gold jewelry and clutch. The hardest part is deciding which one! Long are the days where the little black dress was the only must-have in a lady's closet. We now need the little white dress, the little red dress &, in my humble opinion, the little blue dress. I especially find myself suggesting this color to the power ladies in my life aka the career women on the sure path of success. At the moment my favorite homemade brunch accompaniment are these Cheddar Jalapeño Biscuits (no rolling required!). They are so good & taste amazing after being frozen for next weekend’s brunch! (In my opinion, brunch is truly the best invention ever. Why? Because I get to enjoy my favorite breakfast foods at a decent time. Let’s get real – under no circumstance would I wake up earlier to cook myself a nice breakfast prior to a long work day). We are at the half-point of "fashion month" right now, and, for those of us watching from a far, this is a great time to reflect and learn about the creative process and journey designers undertake with each runway show they present, new store they open, etc. 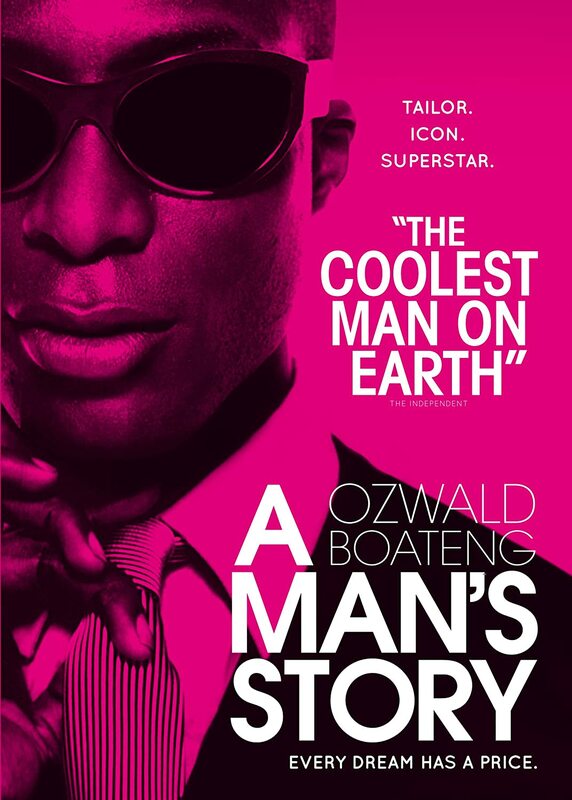 On the heels of London Fashion Week, I find it an opportune time, to suggest a foray into menswear with Ozwald Boateng's documentary "A Man's Story." The world as a whole is highly fixated on women's fashion and that has worked just fine. However, isn't it fascinating to lend just a bit of attention to that which is foreign to you? For me, that has always been fashion for the male species, given, I grew up in a household dominated by females (six sisters, mom, dad and one baby brother - to be exact). Yet, I always admired and appreciated the clean lines embraced by men in a good jacket, tailored pants, and perfect fitting shirts, but, I didn't know much about what went into it. So, when I came across Boateng's journey (filmed over twelve years), I embraced the opportunity to get a peak behind the scenes of Savile Row, so to speak (in 1994 Boateng became the youngest and first black tailor to have a store on the row), and gain exposure into the foreign lands of menswear. Browsing through the many behind the scenes shots during the ongoing New York Fashion week I loved seeing that the fierce brow is still going strong! Now, sadly we are not all blessed with the brows divinely bestowed on Barbara Fialho, or Camilla Belle (my brow goddesses), but we all can make the best of what we have got. Here are some tips to get your best brow forward! States of America, on taking your time. The founding fathers of the United States of America set the foundation for that which we enjoy today. Who better than to draw inspiration from today than someone that embodied dedication, perseverance and achievement aka Mr. Benjamin Franklin, The First American. Recipe by Trisha Yearwood via food network. Labor day means one thing: summer has officially come to an end. Usually, we focus on the sartorial meaning aka no white after labor day and we can now shop and use awesome jackets. But, labor day also means a shift in what we eat, we bypass cold treats for comfort foods and give thanks for the layers of clothing which hide those extra lbs that are the result of many a yummy treat. I bake year round, but, today I am excited to share a new recipe tested this past weekend as a result of a cookie found in my work kitchen last week; the white chocolate chip & cranberry cookie.